I've actually been asked this: What distinguishes a "hit and run" trip from a normal business trip? If you spend only one night in a hotel room. If you're fortunate to work an event and get home before you have to spend that second night away, that's a "hit and run." If you manage to to work an event that doesn't even require a stayover (Columbia SC, Jacksonville or Atlanta), that's just plain theft. So on Saturday I took the two shortest back-to-back flights you can imagine, and I was in Knoxvull by nightfall. 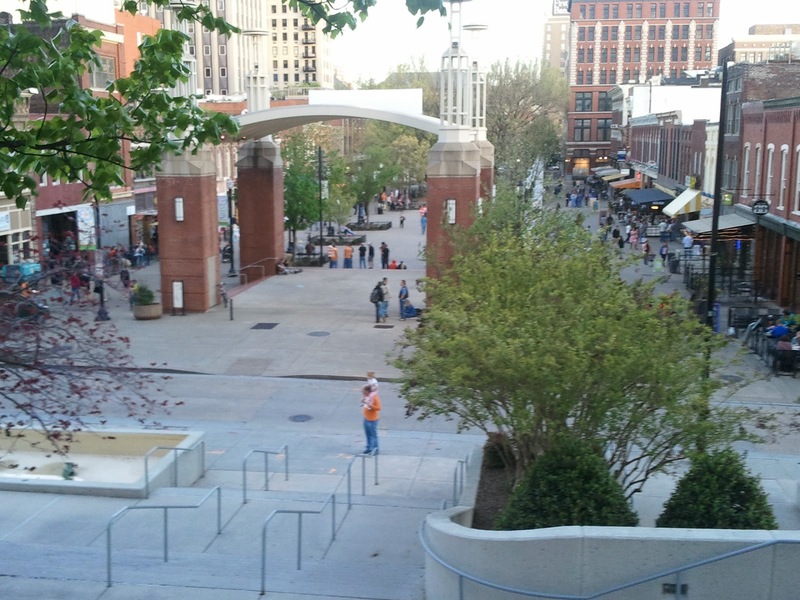 I've been to Knoxville over a dozen times in my career, but I never seemed to stay in the right places. Whether I was there covering football, basketball, softball, or baseball, I always seemed to find myself in some isolated hotel. That wasn't the case on this trip. It was a convenient downtown deal, and I could see Market Square from my 12th floor window. So I wandered down for some dinner. 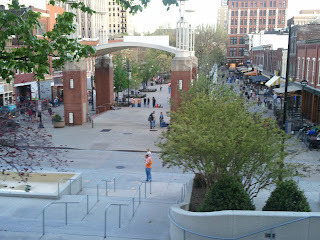 The orange and white game was earlier in the afternoon, so there was a lively (read: drunk) crowd out on the square. It was the first game for new football coach Butch Jones, as well as the first game for Smokey X.
I headed into Latitude 35, a high end bar & grill for some NBA playoff action and a couple of beers. Dinner was not especially memorable. I got back to the room and finished my prep for the Tennessee/Ole Miss Sunday baseball game while Men In Black II played on the giant-screen TV in my room. The film of course features Johnny Knoxville. The game was pretty crisp. Tennessee starter Zack Godley was pitching a gem on his 23rd birthday against the #17 Rebels, but threw a ball away in the 9th which led to a 3-run rally. Ole Miss won 4-3 and completed the sweep on the road. Most importantly the game ended in an economical 2 hours and 29 minutes, and we all made our flights home. My quesadaillas at Ruby Tuesday at Tyson McGhee airport were far better than Saturday night's dinner downtown. But I'll be back in two weeks to try it all over again.